Publisher Deep Silver has announced, via their official website, the European release date for Grasshopper Manufacture’s Killer is Dead. It will be out there on the 31st of August. Deep Silver also took the opportunity to announce a limited edition for Killer is Dead. The LE will come with the soundtrack, composed by Akira Yamaoka. It will also feature a papercraft diorama, a wicked poster and the official artbook for the game. It will also give players access to some DLC missions, including the famous gigolo missions. Deep Silver today announced the limited Fan Edition for the action game KILLER IS DEAD™ that will be released on the PlayStation®3 computer entertainment system and Xbox 360® games and entertainment system from Microsoft on August 30, 2013 in Europe. This exclusive Fan Edition will be available at a price of EUR 64,99. 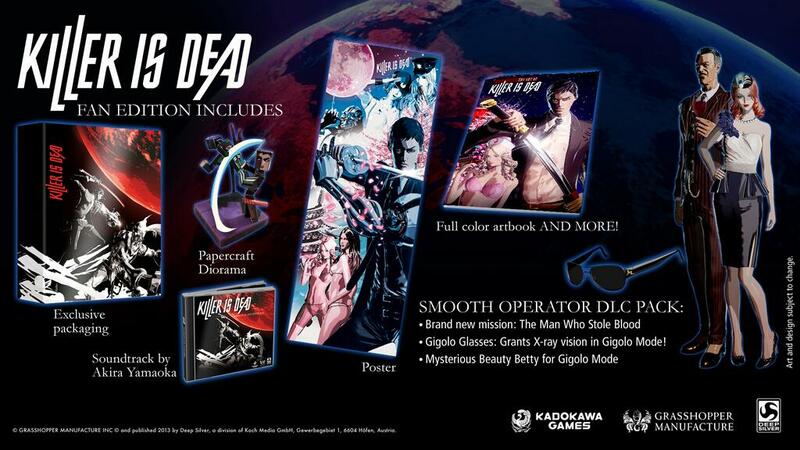 At launch, Deep Silver will also make a Limited Edition available for KILLER IS DEAD that will contain the full Smooth Operator Pack downloadable content at no extra cost. This version of the game will have a price of EUR 59,99. XSEED have yet to announce the NTSC release date for Killer is Dead.